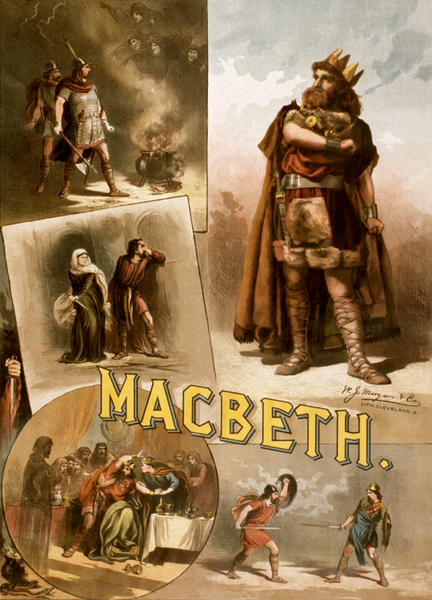 Macbeth is the most dramatic and tremendous play among the Shakespearean tragedies. A Shakespearean tragedy, as a rule, has a special tone or atmosphere of its own. The effect of this atmosphere is marked with unusual strength in Macbeth. The main theme of the play is ambition; however, there are other themes which are equivocation, appearance, reality and the murder of Duncan. Images of darkness or blackness, broads over this tragedy. It is remarkable that almost all the scenes take place either at night or in some dark spot: The vision of the dagger - the murder of Duncan - the murder of Banquo - the sleep walking of Lady Macbeth. The blackness of night is to the hero a thing of fear, even of horror; and what he feels becomes the spirit of the play. In the whole drama the sun seems to shine only twice (where Duncan sees the swallows flitting round the castle of death, and when at the close avenging army gathers to rid the earth of its shame). so much blood in him?" Vividness, magnitude, violence of the imagery and their influence contributes to form its atmosphere (of pouring the sweet milk of concord into hell-of the mind full of scorpions). The very first words uttered by Macbeth: "so foul and fair a day I have not seen"
The words of the witches in first scene: "fair is foul, and foul is fair." When Macbeth emerging from his murderous reverie, turns to the nobles saying: "Let us toward the king" his words are innocent but to the reader have double meaning. So does the contrast between the obvious and the hidden meanings of the apparitions. Now let us start with the a brief comparison of both characters. Macbeth and Lady Macbeth are sublime, and both inspire the feeling of awe. They are never detached in imagination from the atmosphere which surrounds them and adds to their grandeur and terror. For, within them is all that we felt without-the darkness of night, lit with the flame of tempest and the hues of blood, spirits of remorse, and maddening visions of peace lost and judgement to come. These two characters are fired by one and the same passion of ambition. They are born to rule, if not to reign. They are contemptuous to their inferiors, so we observe in them no love of country, and no interest in the welfare of anyone outside their family. They have no separate ambitions, they support and love one another, they suffer together. On the other hand, they are also contrasted, and the action is built upon this contrast. Their attitude towards the projected murder of Duncan are quiet different, and it produces in them equally different effects. "Shall sleep no more, Macbeth shall sleep no more." Therefore, whenever his imagination stirs, he acts badly, it possesses him, and is so much stronger than his reason, but when it is asleep he is firm, self-controlled and practical. That heart-sickness which comes from Macbeth's perception of the futility of his crime, and which never leaves him for long, is not, his habitual state. It could not be so, for two reasons. The first reason, the consciousness of guilt is stronger in him than the consciousness of failure; and it keeps him in a perpetual agony of restlessness. His mind is "full of scorpions"- He cannot sleep- He "keeps alone", moody and savage. The second reason is ambition, the love of power, the instinct of self-assertion, are much too potent in Macbeth to permit him to resign, the "will to live" is mighty in him. He faces the world, and his own conscience, desperate, but never dreaming of acknowledging defeat. He challenges fate into the lists. He speaks no more, as before Duncan's murder, of honor or pity. That sleepless torture, he tells himself, is nothing but the sense of insecurity and the fear of retaliation. The cause of his fear is Banquo. He has become his chief counsellor because the kingdom was promised to Banquo's children. Banquo, then, is waiting to attack him, to make a way for them. This is the fear that will not let him sleep, and it will die with Banquo. There is no hesitation now, and no remorse. So, some strange idea is in his mind that the thought of the dead man will not haunt him, like the memory of Duncan, if the deed is done by other hands. The deed is done, but instead of peace descending on him, his deed confronts him in the apparition of Banquo's Ghost. However, it has less power, and he has more will. Now, Macduff is the one who spoils his sleep. He shall perish. He goes to seek the witches; he has no longer any awe of them. They till him he is right to fear Macduff; they tell him to fear nothing, for none of woman born can harm him. So, he determines not to spare Macduff. The witches have done their work, and after this purposeless butchery his own imagination will trouble him no more. The whole flood of evil in his nature is now let loose. He becomes an open tyrant, dreaded by everyone about him, and a terror to his county. A.C. Bradley does not agree with those who find in his reception of the news of his wife's death proof of alienation or utter carelessness. "She should have died hereafter; there would have been a time for such a word," he thinks that Macbeth has no time now to feel. Only, as he thinks of the morrow when time to feel will come. In the very depths, a gleam of his native love of goodness, and with it a touch of tragic grandeur, rests upon him. The evil he has desperately embraced continues to madden or to wither his inmost heart. On the other hand, Lady Macbeth in the first half of the play not only appears more than in the second half but also exerts the ultimate deciding influence on the action. She is distinguished from her husband by her inflexibility of will. She knows her husband's weakness, and how he scruples "to catch the nearest way" to the object he desires, and she sets herself without a trace of doubt or conflict to counteract this weakness. To her there is no separation between will and deed, and as the deed falls in part to her, she is sure it will be done. She takes the superior position and assumes the direction of affairs, appears to assume it even more than she really can. She animates him by picturing the deed as heroic, 'this night', great business, while she ignores its cruelty and faithlessness. She bears down his faint resistance by presenting him with a prepare scheme which may remove from him the terror and danger of deliberation. She rouses him with a taunt no man can bear, and least of all a soldier, - the word "coward". Through the admiration she extorts from him, and through sheer force of will, that she impels him to the deed. Her eyes are fixed upon the crown and the means to it; she does not attend to the consequences. Her plan of laying the guilt upon the chamberlains is invented on the spur of the moment, and simply to satisfy her husband. Her passionate courage sweeps him off his feet. His decision is taken in a moment of enthusiasm. In presence of overwhelming horror and danger, in the murder scene and the banquet scene, her self-control is perfect. She helps him, but never asks his help. She leans on nothing but herself. And from the beginning to the end her will never fails her. We are sure that she never betrayed her husband or herself by a word or even a look, save in sleep. However appalling she may be, she is sublime. - We find no trace of pity for the kind old king. - No consciousness of the treachery and baseness of the murder. - No sense of the value of the lives of the wretched men on whom the guilt is to be laid. - No shrinking even from the condemnation or hatred of the world. If Lady Macbeth of these scenes were really utterly inhuman, or a "fiend-like queen", as Malcolm calls her, the Lady Macbeth of the sleep-walking scene would be an impossibility. The one woman could never become the other. When she tries to help him by representing their enterprise as heroic, she is deceiving herself as much as him. Also, in these earlier scenes the traces of feminine weakness and human feeling, which account for her later failure, are not absent. Her will was exerted to overpower not only her husband's resistance but some resistance in herself. The greatness of Lady Macbeth lies almost wholly in courage and force of will. It is an error to regard her as remarkable on the intellectual side. To her the blood upon her husband's hands suggests only the taunt. and the blood to her is merely "this filthy witness". "Here's the smell of the blood still" wholly unlike her husband." Her most poetical words "All the perfumes of Arabia will not sweeten these little hands" are unlike his words about great Neptune's ocean. "The Thane of Fife had a wife: where is she now?" that she has even learned of her husband's worst crime, and in all the horrors of his tyranny over Scotland, she has, no part. Disillusionment and despair prey upon her more and more. That she should seek any relief in speech, or should ask for sympathy, would seem to her mere weakness, and would be to Macbeth's defiant fury an irritation. Thinking of the change in Macbeth, we imagine the bond between them slackened, and Lady Macbeth left much alone. She sinks slowly downward. She cannot bear darkness and has light by her continually: 'tis her command. At last her nature, not her will gives way. The secrets of the past find vent in a disorder of sleep, the beginning perhaps of madness. What the doctor fears is clear. He reports to her husband no great physical mischief, but bids her attendant to remove from her all means by which she could harm herself, and to keep eyes on her constantly. Her death is announced by a cry from her women so sudden and direful that it would thrill her husband with honor if he were any longer capable of fear. Malcolm, in the last words of the play, tells us that it is believed in the hostile army that she died by her own hand. It is in accordance with her character that even in her weakest hour she should cut short by one determined stroke the agony of her life. The sinking of Lady Macbeth's nature, and the marked change in her demeanor to her husband, are most strikingly shown in the conclusion of the banquet scene; and from this point pathos is mingled with awe. In conclusion, she despises what she thinks the weakness which stands in the way of her husband's ambition, but she does not despise him. 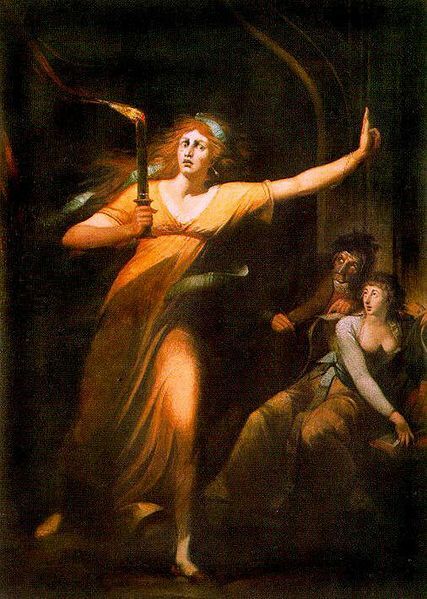 Her ambition for her husband and herself proved fatal to him, far more so than the prophecies of the witches; yet even when she pushed him into murder, she believed she was helping him to do what he merely lacked the nerve to attempt. The sleep-walking scene, again, inspires pity, but its main effect is one of awe. Regarding her from the tragic point of view, we may truly say she was too great to repent.